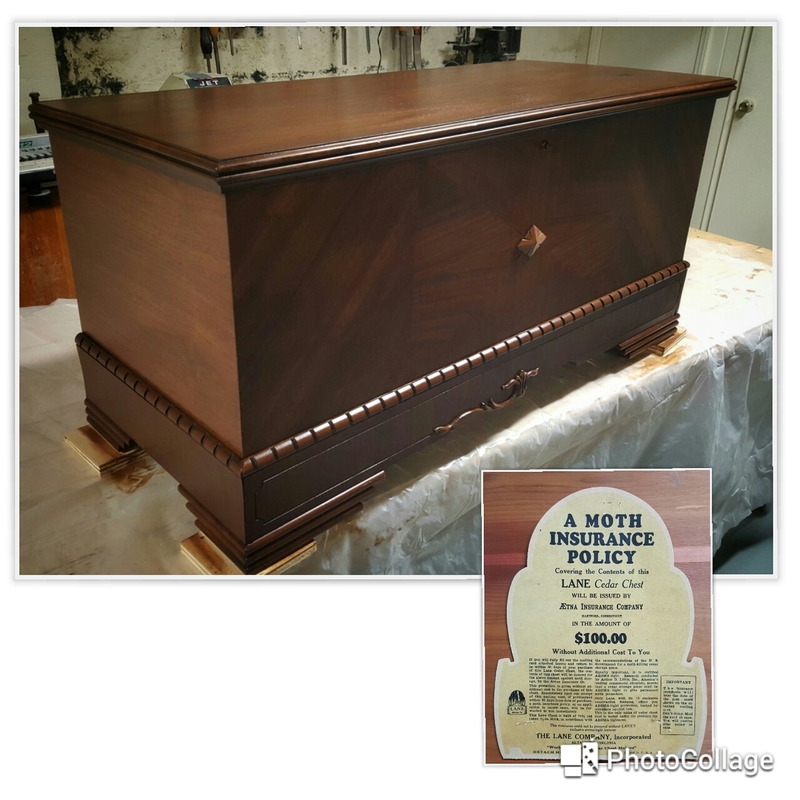 Here is the cedar chest restoration job we recently completed. We’re quite pleased with the results. We started by stripping off all the old finish. This chest had been “loved” on for many years and what little of the original finish that was remaining was in rough shape – so we had no choice but to take it down to the bear wood. Since we’re a professional shop, we have an overflow system that allows stripper to be pumped through a fluid hose with a brush on the end. The piece sits in a shallow tub while we gently scrub and rinse it down with stripper. This “washing” off of the finish is very efficient and not harmful to the piece. After we had all of the old finish stripped off we wiped it clean with lacquer thinner and left to dry for a day. Once dried there were a few areas of veneer that were damaged so we repaired these areas prior to staining. In this case we used one our own stain colors which is similar to the color Minwax’s English Chestnut. After staining with our own stain, we air brushed some black stain around some of the edges and crevices. This enhances the details and assist in bringing back some of the patina that was removed when stripping. Notice in the picture below we saved the advertisement that was attached to the inside of the chest and reapplied once done with the restoration. Lane must have had a collaboration with an insurance company that offered insurance. How cool is that?? But given inflation you’d probably need a bit more than $100.00. Finally we applied several coats of lacquer, rubbing out in between coats. The final result is a nice soft luster on a piece that will last another couple generations. I would love to strip off all the old paint, have a new lid made and try to restore it. My question is how do you get the old cedar smell back or does it just die out and can’t be revived? I’m just curious if anyone would know. No way to get the smell back from the existing wood however you could place pieces of newly cut cedar in the box which would bring back the smell.